Perhaps one of the most challenging issues regarding innovation is the lack of an established definition. Oh, sure, some will say innovation is defined as "new ideas that deliver value" or another variant, and they'll be right. But the story doesn't end there. Innovation has either lost all meaning or has so many situational context meanings as to be practically meaningless. I wanted to talk about the hazy definition of innovation and the impact it has on the adoption of what we believe is the most important aspect of innovation - innovation as an internal competency. You see, the definition of "creating new ideas that provide value to customers" is OK, but it can apply to firms that consider that a statement of strategy, or firms that perform the activity haphazardly and periodically. While neither of these instances are representative of successful innovation outcomes, both in general terms can be described as innovation. And it's for this reason that many commentators, pundits, cynics and general curmudgeons like to say that innovation is futile, dead, passe or other negative adjectives. Gartner, in their wisdom and having the opportunity like Zeus to scan the history of information technology, noticed that all new concepts and technologies proceed through a predictable "hype cycle". Typically that begins with a lot of promises about what the new technology will do, plunging into the pit of disillusionment as people realize that the new technologies are just that - technologies not solutions. Then enterprising entrepreneurs and others build meaningful solutions which incorporate the technologies or capabilities and provide meaningful solutions, so the stock of the technology rises again. I've provided my own "innovation" hype cycle below, but with a twist. Innovation, you see, must be carefully defined before we plop it into any strategic framework. I'll argue that innovation as a strategy or theory is well accepted. 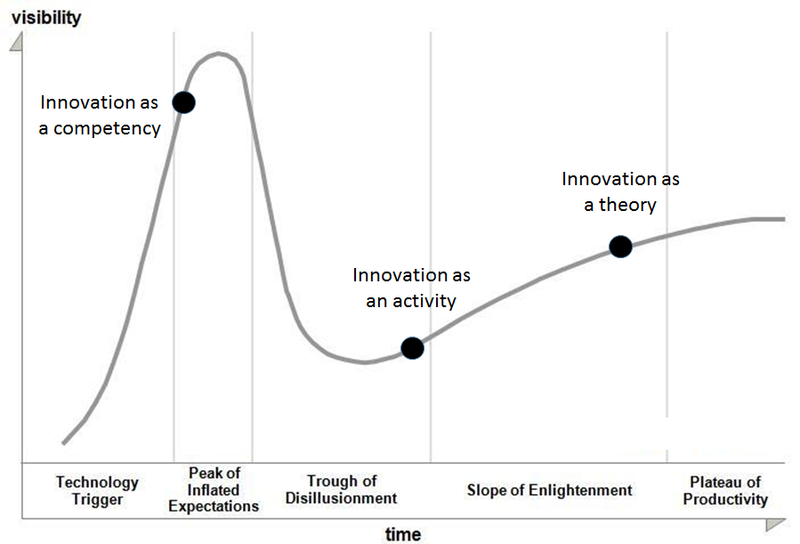 On the Gartner hype cycle innovation as a strategy or theory is on the "slope of enlightenment". Clayton Christensen did that for us, and now CEOs and senior executives in most industries laud the benefits and bake innovation into their strategic goals. Innovation as a theory or strategy is reaching the "plateau of productivity" after plunging into the trough of disillusionment five to ten years ago. On the other hand, innovation as an activity, that is, where innovation teams are off working on creating new products and services based on an identified need or new market opportunity, is just emerging from the trough of disillusionment. Discrete innovation activities have rarely delivered what was promised. Several recent studies indicate that most innovation activities don't deliver the promised results. Some of that can be chalked up to mismatched strategies, unrealistic expectations, poor skills and training and an overhyped capability. But right now we are on the verge of better innovation projects, but that's not what we want to ultimately optimize. If you'll look further to the left you'll see one more innovation concept - innovation as a core competency or discipline. In my opinion that concept is just reaching the peak of the hype cycle, and trails innovation as a project. The difference is that innovation as a competency builds infrastructure, skills, methods and processes to simplify innovation projects and reduce cultural resistance. Yet far too many firms have considered innovation an occasional, one-off activity rather than a repeatable, consistent discipline. When firms wake up to the need for more capability and discipline, then it too will complete the hype peak and plunge rapidly into disillusionment, as innovation teams, centers of excellence, Chief Innovation Officers and others are unable to prove value, because until innovation as a strategy or theory is fully embraced and understood, it's difficult to invest in innovation as a competency or discipline. Of course, like most management fads we've done this backwards, top down instead of bottom up, demanding meaningful results before capabilities were developed, weak, ill-fated experiments that were easy to ignore. Today we've finally got executives who think that innovation is important. They aren't sure what that means, but they want more innovation when possible. Can we restrain ourselves and offer up innovation skills and competencies before plunging into innovation activities? So far the results say no, and if all innovation focus is placed on innovation projects and activities, you could see all three of my innovation definitions dragged into the trough of disillusionment. Things don't have to progress only to the right, they can slide back to the left, especially into the pit. When an employee or consultant asks you what you mean when you say "innovation", it's not a throw-away line or a philosophical debate. Defining and understanding the difference between innovation as a strategy, as a discrete, one time project or as a capability or discipline has implications. Words matter, especially words that have hazy definitions that we allow others to define for us. Executives, senior managers and innovators, pay close attention. Define what innovation is, what it means, its purpose and goals, before anything else, or you too will end up a victim of the hype cycle. For years we've worked with corporate clients, trying to help improve innovation capabilities and accelerate innovation projects. One of the common recurring questions we receive has to do with finding the "right" people. "Who are the best innovators in our organization?" is a question we hear quite often. In the past we could respond with anecdotes, or point to a few signals, such as the individual's creativity or their "passion", but these were highly subjective and difficult to measure quantitatively. For years we've known that a real need exists to identify people with high innovation capacity. After over a year of research, talking with our project teams and identifying the traits that make good innovators, I'm pleased to announce our latest offering: an online assessment that will help identify the people in your organization who possess innovation capacity. We call this the OVO InnoTraits™ Assessment. After listening to our clients lament the lack of insight about innovation skills and capacity, and after working with a number of innovation teams formed from people with limited innovation interest or skills, we developed the InnoTraits Assessment to identify people who possess more traits and characteristics that enable them to perform more effectively at innovation tasks. This assessment is based on a significant amount of original research, talking to hundreds of project teams working on innovation. We were also able to review and harvest a wealth of insight from academic research and publications such as The Innovator's DNA. If you are interested in reading the white paper that supports our findings, you can find the paper here. Once we identified the demographic and psychographic traits that we believed identified likely innovators, we surveyed hundreds of them to determine their views, and to learn more about them. As we reviewed their responses, we confirmed a number of our assumptions about key demographic characteristics and traits, and also identified a number of other habits or experiences that may lead to greater innovation capacity. For example, from our research it became clear that good innovators have broader and deeper personal networks than their peers, which means they come in contact with more information and ideas. Further, good innovators are often frequent travelers, which forces them to confront new experiences and settings. Finally, good innovators are typically deeply involved in a hobby or pastime outside of work, which opens up new creative thinking and allows the innovator to draw inferences between their hobbies and their work. Once we finalized a list of psychographic and experience traits we worked with Decison Analyst, a well-known developer of individual and team assessments, to help us develop an assessment vehicle that people could complete quickly and easily but which would provide meaningful results. After several trials with OVO customers to test the assessment and validate the reporting and results, we are pleased to make the assessment commercially available. On our website you can review a PowerPoint with more information about the assessment, view sample reporting from the assessment and learn about pricing for the assessment. The InnoTraits Assessment is best used across a large portion of the organization, because that allows us to establish a "corporate" norm for innovation traits and identify people who possess critical traits to a larger degree than their corporate norms or peers. In this way we can help corporations develop high capacity teams that have a much greater chance of innovation success. By building innovation teams based on innovation traits, we can ensure that the team has the appropriate balance of insights, skills, creativity and openness to further innovation success. We can also identify corporate strengths and potential gaps or blindspots that should be considered in any innovation activity. Using the data gathered from the assessment, innovation team leaders can build the most effective, most capable teams and ensure that all vital traits are represented. Further, using the results from the assessment, human resource executives can identify organizational or corporate training or development goals and rethinking hiring to identify people who possess more of these vital innovation traits. The results from the assessment can improve personal training and professional development goals as well as establish new corporate training and hiring practices. Further, the insights from the assessment can help Human Resources, Talent Management and other executives rethink leadership development. But most importantly your organization can place the best, most engaged and capable people on an innovation project. This doesn't guarantee success, but placing the best people on critical innovation projects will go a long way to improving the chances for success. If you are interested in our InnoTraits assessment for your company, line of business or product group, see our Skills Assessment webpage and read the white paper to learn more. When you are ready, order the assessment from our pricing page. The assessment is delivered online to the employees you select, and takes only 10-15 minutes to complete. Once the assessment is complete you'll have an aggregate report and each individual will receive a personal profile letting them know how their skills and traits map to the corporate average. With this data you can build better innovation teams and improve your training, hiring and leadership development to build stronger innovation capacities. As new competitors emerge and the global market becomes more intertwined, product lifecycles are shrinking. Innovation can no longer be a sporadic, haphazard activity but must become a consistent competency, supported by people who can accelerate the activities and produce meaningful results. You need to find your best innovators and ensure they are actively engaged in innovation activities. For most people and organizations, developing a skill or competency takes time. The development of a skill usually starts with the basics - the building blocks of an activity. When we learn new tools or activities, it's not unusual to break them down into smaller components to learn the basics. For example, when I learned a tennis serve, it was in a series of small steps: how to stand, how to toss the ball, how to hold the racket, how to hit the ball. These small, incremental steps are all important, and when reasonably mastered can be placed together at speed to become the full activity. It's very difficult to learn any new activity or methodology as a whole, and even more difficult to master an activity or tool unless you learn the components that make up the whole task. Whether you are learning to serve a tennis ball, or learning to place debits and credits in the right columns, you typically start with the smallest activity or unit of work, master that and then press on to learn the next sub-task or activity. Only when you have a reasonable understanding of each task or activity do you begin to put the entire activity together. Much like playing the piano, you may learn only a few measures of a song at a time, or perhaps only the left or right hand portion of the song at a time, then put it all together. This notion of breaking things down, mastering the small activities and steps and then bringing the complete method or activity together once the small steps are mastered has been a trusted way of learning new or complex activities since man evolved and learned to pass on knowledge. Why then do we ignore this proven methodology when we innovate? When large companies innovate, they recruit a group of people who are typically very good at their regular jobs. They define a hazy, often unrealistic new goal: bring us a killer new product idea. Then they place the team under unrealistic timelines and shoot the starter's pistol. There's no team formation or "norming", there's no skill development and there's often little shared understanding or even any real belief that the activity is anything more than an academic exercise, to show "management" that there are teams working on the "next big thing". No one stops to wonder if the team has any hope of achieving that goal. Innovation is anything but the ordinary for the vast majority of employees, managers and executives. The ordinary is what they do every day. It's repeatable, it's measurable, it has been done before, and most of the risk and uncertainty has been beaten out of the ordinary. The scope is well-defined, the deliverables are evident and the ROI is proven. This is the "ordinary" day for the vast majority of people, and we've trained them well to perform in this ordinary way. Now, when we innovate, we tend to ignore every truism about learning, change management and uncertainty. We gather a cross-functional group of highly capable managers (because that's what we do with every project) and tell them to find a big new idea. The instructions are a big vague because those giving the instructions don't really know what they want or need, only that it is something bigger and different from what they have. So an unprepared team that has little ramp-up pursues a vague, poorly defined outcome with little training or tools. Instead of breaking down the important actions and learning how to do innovation well, we ask that our innovation teams hold serve at Wimbledon against Nadel, starting tomorrow. Oh, and win while you are there, by the way. If in all other forms of human endeavor the practice is to learn an activity by breaking down into smaller sub-activities, practicing and perfecting the sub-activities before trying to complete the entire activity, why would we toss our teams to the lions in the way most executives do when they ask a recently formed and unprepared team to innovate? When push comes to shove, "everyone" knows that innovation is about finding new ideas, so the team will move quickly and ineffectively to generate ideas. But without experience or training, and lacking good definition, any idea that isn't very similar to existing products and services will be rejected. They know no other outcome. Ah, you'll claim. We don't have that problem. We provide training on innovation tools for our people and many of them have completed innovation training, back, six or eight months ago. In many cases, this is almost as useless as turning the team loose with no training at all. Innovation tools and methods are far different from what people do everyday, and unless an innovation activity follows on quickly after the training on innovation tools, the knowledge is useless because it is not reinforced. People will quickly revert to what they know well, and do everyday, so innovation looks an awful lot like daily business as usual, with the same constraints using the same tools. No wonder a lot of innovation is barely differentiated from existing products. To conduct an innovation activity effectively, one must first "norm" the team that was formed. The team needs to trust each other to do the work they will be called on to do. That forming and norming takes time, and the team must adjust to a new working rhythm and reality. Second, the team must receive training on an innovation method or process that will support the activities necessary for innovation success, and must receive in-depth training on the tools and methods responsible for the upcoming phase. We call this "just in time" training, because it occurs just as the team will need the tools, and allows them to use the tools in the context of an important activity, rather than as an academic exercise. The recommendation I'm making - to form and norm the team, to provide them training in the tools they'll use and ensure a practical, well defined project scope or objectives - will take what is most precious today - resource time. Money is cheap and resources are valuable, but you can't trade money for time in this exchange. People need the time to form and norm, to learn a new way to think and to trust each other. They need time to learn and exercise new tools. Unless and until you are willing to make that investment, you'll simply waste what little time and money you are willing to spend on innovation. Rather than thinking of innovation as a means to gain a compelling new product or a differentiated service, think about innovation as an investment in your future capabilities. Innovation, done well, is a powerful tool that can be repeated. Done poorly, it builds antibodies in your organization that will resist change even more vehemently the next time you try. I love detective novels. It doesn't matter the setting or protagonist. I've enjoyed Ian Rankin's Inspector Rebus, set in Edinburgh and Gary Disher's novels about Hal Challis in Australia. I've just finished three books by Camilleri, who features Detective Montalbano in Sicily. The setting can be a significant contributor to the story, or just a backdrop. The detective can be a fine upstanding individual or an idiot savant, who rubs his colleagues the wrong way but solves crime. Good detective fiction is the same where ever it is set, whoever is the detective. The best stories present a lot of clues during the novel, and force you to put the pieces together. Often, at the end a critical clue or insight springs from nowhere to confirm a suspicion or cast doubt on a course of investigation. Police dramas often focus on three key aspects of a crime: means, motive and opportunity. That is, did a person have the "means" to commit the crime, were they driven by a specific motive, and did they have the opportunity to commit the crime. If all of these things are true about an individual, then there's a good chance you've found your killer. If one or more of these are missing or can't be discovered, the chances of solving a crime are bleak. These are some of the "critical" components to solving a crime. Similarly, innovation has some "critical" components that in our experience are often incomplete, if not completely absent. As innovators, we should be detectives, asking ourselves, what critical components for innovation success does this client lack? I've listed a few critical components for innovation success below. If you are starting an innovation project, make sure they exist and are fully supported. If you've "failed" at an innovation activity, perhaps this is a good "post mortem" to find out what went wrong. Sorry, but when you ask people to innovate, they need to understand where the firm is trying to go. Should innovation serve to drive more of the same - pursue the same customers and markets? Are we trying to extend our value proposition in existing markets, segments and products? Are we trying to enter new markets, industries, geographies or segments? People laugh at the "vision" thing. Vision and mission are often overwrought and useless, because executives state them once at a corporate meeting and then let the business go back to whatever it was doing previously. Most corporations have strategies and visions that are frequently communicated and never understood two levels down below the CEO. Unless and until you can create a purposeful, meaningful vision that you can communicate to innovators, you can't innovate successfully. What's the business opportunity or problem that if addressed drives new revenue and growth and fulfills the vision? Can you collapse that to a statement? If your vision is to grow your business into new channels or markets, can you create a two or three sentence description of the opportunity and how you'll measure the results? The vision gives you DIRECTION, the opportunity provides SCOPE. You can't innovate without a "vision" or strategy, but that's not enough. You need to provide "scope" in terms of a specific opportunity or need or challenge. Are you willing to do what it takes to discover needs and to learn about new markets or segments? Do you have the humility and patience to learn about unmet needs, to discover and validate stuff that you don't know? Or will you simply wade into a new market and offer your same set of services and products, confident that you know more about what customers need than they do? In hindsight many innovators will admit that they skipped this component. Instead of gathering insights they asserted that they knew what people needed. Or, they did perform some discovery work, mainly box checking, seeking insights that confirmed what they believed. Only innovators who are eager enough, curious enough, humble enough to learn something new really succeed. Efficiency is easy, innovation is hard. Therefore, you need your best, most passionate people working not on the day to day efficiency stuff, but on the things that are difficult and critical to driving growth. Where are your best people focused today? What skills and knowledge do they have, and what do they lack? Are they even willing to take the "risks" that innovation presents? Do you have any ability to identify the people in your organization who have good innovation skills? If you "can't afford" to place your best people on an innovation activity, or if you can't afford to give them the time and skills they need to succeed, don't start. Innovation is not a secret science, a black art or a magic formula. It consists of good problem definition, divergent/convergent thinking, discovery of needs, understanding future trends, generating good solutions in context of the discovery, rapid prototyping and feedback loops, and building new solutions that you can deliver to the market. There are a number of methodologies, processes and tools that support and sustain this process. Do you know them? More importantly, does anyone in your organization know how to use them effectively, and in the right combinations? The most critical missing piece in this list is...whichever one is missing. All of these matter, and they all are interconnected. You can't double down with great people and hope to achieve good innovation if they don't understand the vision or opportunity, or lack discovery or tools. The best advice I can give, and frequently give our clients, is to slow down innovation projects to assess which components exist and, if they exist, their capabilities and commitments. Paul Hobcraft and I created the Executive Workmat as an assessment for this reason. OVO offers Executive Workmat assessments as a service to our clients and prospects, so that you can understand and shore up gaps or missing components before you start innovating, rather than discovering the gap and trying to fix it during a critical innovation activity. As some of you know, I wrote Relentless Innovation several years ago to highlight the challenges of introducing more innovation into companies that had focused for years on honing ever more efficient corporate processes. After years of Right Sizing, Six Sigma, Lean, BPR and other management fads dedicated to improving processes, eliminating waste and improving efficiency, it can be a real struggle to try to introduce innovation. The operating models, what I called "business as usual" resists change, uncertainty, variance and risk. At the time I pointed the finger of blame at middle management, for causing much of the resistance to innovation. Middle managers are the ones who make "business as usual" work, by doing the most with the least. They assign resources, assess priorities, enforce formal and informal cultural norms. They are responsible for hitting the numbers ever 90 days, and don't look favorably on programs or initiatives that distract their teams from achieving specific goals. But as I was mowing my lawn yesterday, I let my mind wander off on this topic. Fortunately it came back, and came back with a simple yet profound insight. Middle managers don't resist innovation simply because they think it detracts from business as usual. Most middle managers don't have the training or capacity for innovation, because innovation isn't a "management" skill, it's a leadership skill. Fortunately, plenty of people have written about the difference between management skills and leadership skills. Some leaders are really managers who focus on getting things done. Some managers are really leaders who can create a vision and lead people to greater achievements. Here's another take: it's the difference between counting value and creating value. That's not to say that managers are only focused on following the rules or only focused on efficiency, but that's what most managers do every day, develop and reinforce rules and guidelines that help the organization become more efficient. Leaders, on the other hand, should be focused on creating a vision and setting direction, doing the most important things, the "right" things, rather than constantly getting bogged down into doing things the "right way". Think for a moment about the critical inputs and success factors for innovation. Innovation needs a burning platform, a big problem to solve or an opportunity to address. It will require creating an as-is and a potential "to be" vision and sharing that with others. Innovation will usually require getting people to step out of their comfort zone. Creating a compelling vision, encouraging people to work and think differently, introducing some risk and uncertainty - these are the hallmarks of a true leader. And, that leader may be a "small l" leader - a true leader not yet in a formal leadership position, or a "big L" leader, with a significant title. But the factors that drive innovation success will be those that originate from people with leadership capabilities, who are comfortable on the edge, creating change, creating a vision and leading people to that vision. I can't help but place this debate in an almost Biblical context - the juxtaposition of shepherds and apostles. Shepherds present classic "manager" thinking. They are tasked with collecting and ensuring the safety of sheep, who are prone to wander, easily distracted, and barely able to care for themselves. The shepherd is fair but firm, and sticks to familiar settings. The shepherd's life is routine but occasionally dangerous, mostly from unexpected attacks from the environment. The apostle, on the other hand, has a message and is intentionally sent out to deliver the insights to many people, creating passion and change. The apostle stirs things up, disrupts the status quo, leads people to a new way of thinking. The apostle's life is also dangerous, because they upset existing order and anger people who are comfortable in their current processes and patterns. In this admittedly thin analogy, the managers are shepherds, keeping the people and processes in fine order, limiting options and focusing attention on what matters. The apostles are leaders, trying to introduce new ideas and upset the dominant order to bring in new ideas or growth. Which role does your organization emphasize? If you want more innovation, you need to rethink the reward systems and the types of people you promote. Innovation requires at a minimum the "small l" leaders, people who can create a vision of the world as it could be, and rally people and resources to do interesting new work. The leader doesn't have to have a significant title, but it doesn't hurt to have the support and backing of a "large L" leader. Trying to get a person who is a good manager, comfortable with existing processes and rules, to become an innovator can be difficult unless that manager also has strong leadership traits and capabilities. These traits and capabilities aren't widespread, and in fact have been beaten out of much of the managerial class over the last 20 years. If you want more innovation, develop more people who have more leadership capability. I am a frequent airline traveler, going from client to client, in the US and frequently overseas on speaking engagements. As such I am reliant on the airline industry, and aware of its increasingly poor service and constrained flights. What's really appalling, however, is to see the airline industry eagerly import failed business concepts and models from other industries. I refer here to the fact that the airlines increasingly are making the majority, if not all of their profits, from fees. Baggage fees were the starter, but increasingly we are seeking new fees emerge. Frontier Airlines has the latest - a fee for carry on baggage. What were these folks doing over the last few years? Did they entirely miss the issues associated with fees and the resulting impact on the financial services industry? The CFPB exists today, in large part, because Congress felt that people were being taken advantage of in financial services and charged extortionate fees. One can imagine in the near future that the FAA or FTC will decide to investigate airline fees, and will create a consumer protection agency to ensure appropriate notification of fees beyond the base ticket price of an airline. Is this really where the airline industry wants to go? Are they so bereft of new ideas that they are actually importing failed concepts from other industries? When your profit model is reliant on charging your customer for things they think should be part of the base package, or for making money when your customer makes mistakes, you may want to start thinking about new business models. There are a number of factors here, and not nearly enough ink to address them all. Two in particular stand out: is your profitability model and business model so constrained that you must charge for services that were once free? and, do you possibly comprehend the idea of customer experience as a leading indicator for differentiation, growth and longevity? If your business model is so obsolete that the only way to make money is to extract fees when your customers make mistakes, or to charge for stuff that was once free, it's time to innovate your business model. I know the airline industry has crappy conditions. The airlines can't control the weather, they are highly regulated, their main inputs (like oil) are highly volatile and they sell a product with rapidly diminishing value ( you can't sell an airline seat once the flight has left the tarmac). Yet these are simply factors of competition. Yes, it's a tough market, but one you chose to participate in. Perhaps instead of adopting and importing business practices that failed and led to more regulation, you'd spend time innovating and thinking about new business models, new partnerships and new customer experiences that drive more value and more margin, or which take out more cost. In the long run, customer experience is what matters. In a commoditized market (I'm again looking at you, airline industry) the race to the bottom continues. But what will sustain and even drive differentiation and share gains is customer experience. Everyone tries the cheapest option once, but once they've encountered the fees and tradeoffs, they will seek out firms that offer low price but excellent customer experience. Right now, Southwest is the only one who gets this, and frankly I think they've strayed from their path a bit. Think about your favorite restaurant. You may go there for the food, or atmosphere, or location, but I bet a lot has to do with the customer experience. Other places may have better food, or better locations, but lack the experience. The trouble is that many executives in larger organizations simply don't understand the value of customer experience, and certainly don't understand how to deliver it through vast networks of customer facing employees. When you find yourself relying on business practices and importing ideas that angered customers in other industries, you shouldn't be surprised at the backlash. This importation signals to many that the innovation cupboard is bare - there aren't any good ideas. It's probably time to bring in fresh perspectives and to radically rethink your core business model. Innovation can help here. I'm looking at you, airline industry. What have you got that will change your business models, keep you profitable, and increase customer experience rather than simply race to the bottom? Importing failed ideas from other industries will only accelerate anger and frustration from your customers. We passengers are willing to experiment with new models, new channels, new business models. Will anyone lead a new round of innovation in the airline industry?